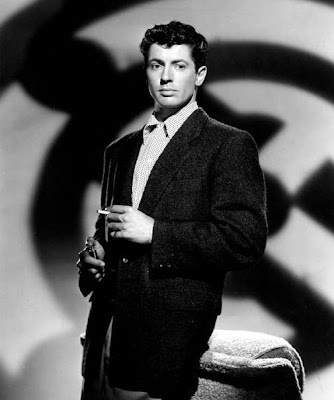 In his first collaboration with Hitchcock, 1948's Rope, he was an elite intellectual spurred by his lover (John Dall) into helping him commit the "perfect murder." Granger was the weak link whose nervous tension threatens to ruin the murderers' plans. The film was shot in 8-minute-long takes and edited in such a way as to give the illusion that the movie was shot in one continuous take in real time. But aside from the technical challenges the actor faced in getting through such long takes without making a mistake, then-closeted Granger chafed at the way the movie tiptoed around the characters' relationship. "The storytelling limitations imposed by not being able to be honest about the real relationship between [our characters] only made it feel more constricted," Granger says in his autobiography, Include Me Out. "It's interesting to speculate on what the film would have been like had [Hitchcock] shot it normally. It's equally interesting to think about what kind of film he would have made if he had not had to worry about censorship." Perhaps it was this openness Granger sought in his screen life that led him to give his best performance in Visconti's Senso (1954). In it, he plays an Austrian officer conducting an affair with a married Italian aristocrat (Alida Valli) during the waning years of Austria's occupation of Italy. As Valli's countess starts to sacrifice her patriotism for the love of Granger's soldier, the actor slowly starts to reveal his character's growing disgust and contempt for his lover. Soon we learn that the soldier was manipulating his paramour all along for his own self-preservation; he deserts the army, disappearing from her life altogether. Working with Visconti and screenwriters Paul Bowles and Tennessee Williams, all homosexual, both freed Granger and informed his performance. The sneers and effeminate laughter of his drunken deserter when the countess finally catches up to him are quite memorable, affirming the basic tragedy of not only the character but the actor, both having to hide their sexuality. He died on Sunday at the age of 85.